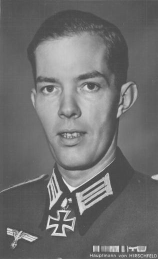 Harald von Hirschfeld (10 July 1912 – 18 January 1945) was a war criminal and general in the Wehrmacht of Nazi Germany who commanded the 78.Volksgrenadier-Division during World War II. He was a recipient of the Knight's Cross of the Iron Cross with Oak Leaves. Hirschfeld, the son of a Mecklenburg merchant, was largely educated and trained abroad, in South America, Spain, London, and Paris. On 23 October 1935, he joined the mountain infantry regiment 98 in Kempten. In September 1943, as a colonel in the 1st Mountain Division, he played a major role in the massacre of the Acqui Division, the murder of 5,155 Italian prisoners of war of the 33 Mountain Infantry Division Acqui in Cephalonia. On 15 January 1945, he was promoted to Generalmajor. On this day he was officially put in command of the 78th Sturm Division, which he had unofficially led since 26 September 1944. He was the Wehrmacht's youngest general officer. He was severely wounded during the Battle of Dukla Pass and died en route to the field hospital on 18 January 1945. He was posthumously promoted to lieutenant general on 10 February 1945. Hirschfeld was married to Sylvinia von Dönhoff, who later married the former fighter pilot Adolf Galland. ^ "Härter als üblich". Der Spiegel (in German). 1969. Retrieved 12 December 2013. ^ a b c d e f Thomas & Wegmann 1993, p. 318. ^ "Adolf Galland". Der Spiegel (in German). 1954. Retrieved 12 December 2013. ^ Thomas 1997, p. 283. ^ Fellgiebel 2000, p. 228. ^ Fellgiebel 2000, p. 64. Thomas, Franz; Wegmann, Günter (1993). Die Ritterkreuzträger der Deutschen Wehrmacht 1939–1945 Teil VI: Die Gebirgstruppe Band 1: A–K [The Knight's Cross Bearers of the German Wehrmacht 1939–1945 Part VI: The Mountain Troops Volume 1: A–K] (in German). Osnabrück, Germany: Biblio-Verlag. ISBN 978-3-7648-2430-3. Thomas, Franz (1997). Die Eichenlaubträger 1939–1945 Band 1: A–K [The Oak Leaves Bearers 1939–1945 Volume 1: A–K] (in German). Osnabrück, Germany: Biblio-Verlag. ISBN 978-3-7648-2299-6. This biographical article related to the military of Germany is a stub. You can help Wikipedia by expanding it. This page was last edited on 21 April 2019, at 23:04 (UTC).